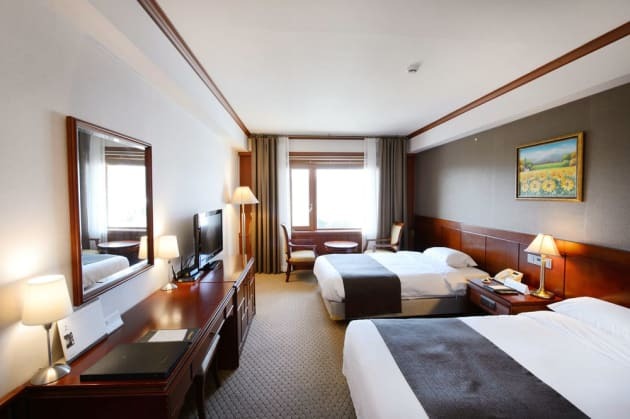 Discover this ancient city with a stay at the Art Deco Hilton Gyeongju hotel, located on the edge of Lake Bomun and surrounded by beautiful parks, countryside and majestic mountains. Gyeongju is the ancient capital of the Korean Shilla Dynasty and the local area offers a wealth of historic sites and attractions. Spend the day soaking up traditional Korean culture and visit nearby attractions like Bulguksa Temple and Seokguram Grotto. Afterwards, unwind with an invigorating workout in the hotel gym. Relax on your balcony and wake up to stunning mountain or lake views form the Art Deco rooms, all with High-speed internet access. Make use of the complimentary hotel business center or conduct business in one of 15 meeting rooms. With staff on hand to co-ordinate and cater any occasion, the 300 capacity event space is ideal for a conference or celebration. Dine on a fantastic array of international cuisine at one of six destination restaurants and bars. Taste the hidden subtleties of fine Japanese cuisine at Genji or opt for Cantonese food at Silkroad. Start the day with a breakfast buffet from Lakeside Café and relax with drinks in the stunning terrace setting of Stars lounge and karaoke bar.